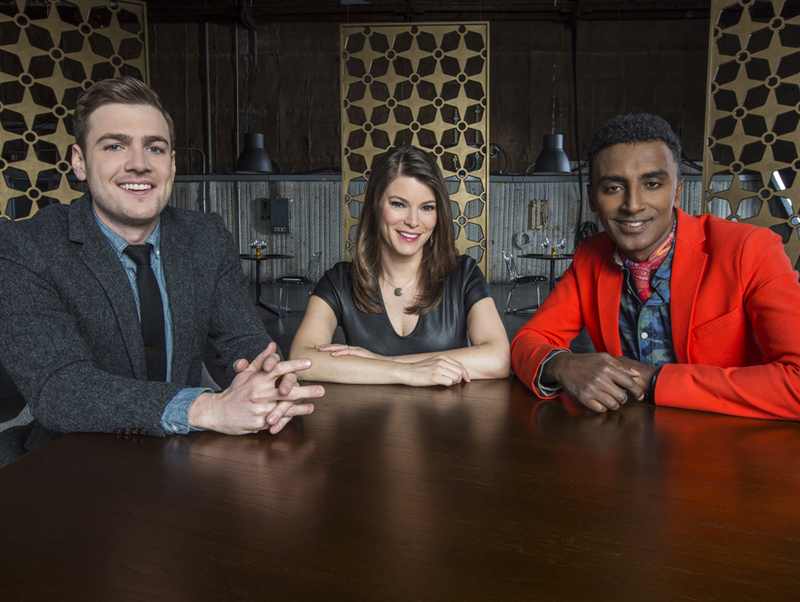 Tonight marks the premiere of the fyi network’s new food series, The Feed, a kooky competition show that stars Top Chef’s Gail Simmons alongside New York chef Marcus Samuelsson (Red Rooster) and writer-comedian Max Silvestri. The trio compete in a slew of trend-inspired food challenges, such as finding the next Cronut-worthy food mash-up and creating a dish for ghosts (to be judged by a medium). Each episode’s loser has to partake in the Humili-Eat, which involves being filmed in super slo-mo while eating something really messy in in a very well lit room. We asked Simmons, also one of the show’s creators, to tell us how exactly this bizarre mix of food and comedy came about. Top Chef is a pretty serious show, but viewers may not know that you’re actually pretty hilarious. What made you want to do something not-so serious? It’s that exact reason. I’ve been doing Top Chef for so long, and while it’s the most fun I’ve ever had, the final edited version shows a very edited version of me. That’s OK—the format is really about the chefs, it’s not about me. But this show is completely different. It felt fresh and new and unlike anything I’ve ever done in my life. It allowed me to completely be myself, and laugh and giggle while still talking very seriously about food. I take food very seriously—obviously, it’s my livelihood—but we want to make sure that the world knows that it’s just food. It’s fun and it’s exciting. And there’s so much of it to discover and explore. I love the idea of being able to take the audience on an absurd adventure and also learn something in the process myself. So, how did you come up with the concept for the Feed? The original idea was very loosely based on Top Gear, which is a hugely successful show in the UK about three buddies who dare each other to go on these crazy outlandish adventures all having to do with cars. We imagined a similar format but revolving around food. The show is really an irreverent take on food from three very different perspectives. I don’t feel that right now in TV land there is a show that talks about what’s going on in the world of food the way we talk about it in our everyday lives—on blogs, on Instagram, and with friends at dinner parties. You know, “Did you hear about this story?” “Have you had a chance to taste this?” “Would you stand in line an hour and a half to eat this?” I don’t think that show exists yet, so why not try and tackle it? What’s the story behind assembling this particular cast of characters? Marcus [Samuelsson] and I have known each other for almost a decade and have worked together many times. He won season two of Top Chef Masters and we’ve worked together on tons of other things over the years. I’ve eaten at all his restaurants. It’s a very small food community in NY so we’ve known each other for a long time. We’ve always loved collaborating and working together. Max [Silvestri] used to do the Top Chef recaps for Eater, which are a little bit cheeky. OK, they were very cheeky, but he was always really nice about me. I was a little nervous when they suggested him, but the thing about Max is he could always make me laugh, even when he was poking fun of my show. I loved his sense of humor. As soon as we were in a room together it clicked. I can say in all seriousness I have this huge crush on Max now. He has that sense of humor that I love. He is funny and self-depreciating. It’s all very intellectual and thoughtful but really fun. He loves food, but he’s also just a normal guy about food. He’s not like Marcus and I who live in the food world and spend our whole lives talking about food. It’s so right that he brought us down to earth in the context of the show. He’s sort of the foil to us. He’s been my greatest discovery in the year 2014. Is the first time most people have really seen you cook? Yes! I went to culinary school. I cooked in restaurants before I worked in magazines. I want the chance to cook! I don’t cook professionally much anymore—I cook on morning shows, I cook for friends and family, I develop recipes a lot. But I don’t get to cook on camera very often. So this gave me a chance to do a little cooking. Though the recipes we’re cooking are pretty ridiculous. As the season goes on they get less ridiculous and I do a bit more real cooking, but I definitely love that I get to get my hands dirty, so to speak. You’re used to being a judge, but on this show the tables are turned a bit and you’re the competitor. How competitive are you? There’s no question that I have drive. To be successful in any industry—particularly the food industry, which is so competitive that requires hours of hard work and dedication—you have to have a certain amount of ambition. I like to use the word ambition instead of competitiveness. But I grew up with two older brothers, I’m scrappy. I don’t like to lose. I did feel a lot of times on the show that I was back as my nine-year-old self with my two brothers, getting beaten up. I would beat them both Marcus and Max at board games, though. Marcus is at a grave disadvantage because of his slight lost-in-translation Swedish roots, and Max I just think I could kill at a number of games. And I’m willing to give it a shot. The Feed premieres tonight at 11 PST on fyi.